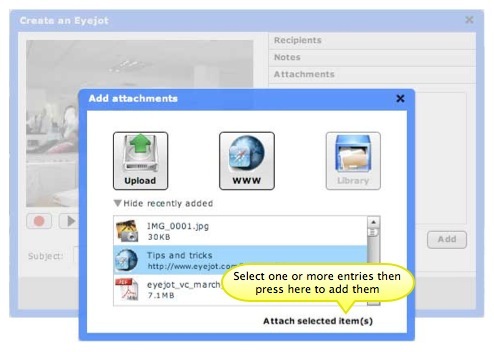 Eyejot Pro Plus members enjoy the ability to add attachments to their video messages. They can add files from their computers as well as links to web pages. Eyejot will also keep track of all your recent attachments and present a list of recently added items for you to choose from when you're adding new ones. This makes it easy to add files to a new video message without having to upload them a second time, or create new web links. If you've added attachments in the past and would like to use this feature to re-add one or more of those objects, just click on the label View recently added. You can also click on the little triangle to the left of that phrase. 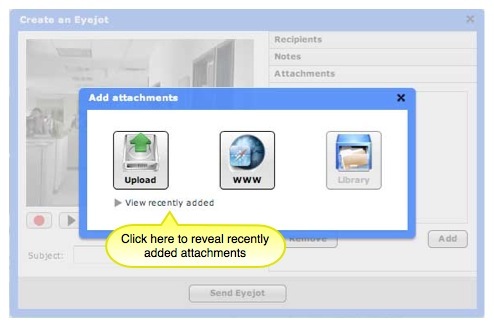 Select one or more of your previously added attachments and then press the label Attach selected item(s). Your attachment(s) will be added to the current message. This feature is only available to PRO Plus or PRO Enterprise users. You can upgrade here. Eyejot is Copyright 2014. All rights reserved.